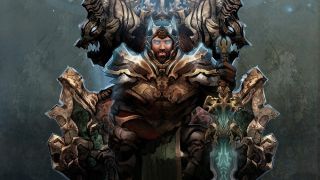 Perhaps it's a good omen that Brad McQuaid—former architect of EverQuest, one-time executive producer of Vanguard—was forced to announce Pantheon: Rise of the Fallen early last week . Fittingly, the Twitter account responsible for the leak was discovered by curious players seeking out developments, and in a recent conversation with me, McQuaid speaks of a world where players discover new abilities and spells scattered throughout a forbidding landscape. The world of Terminus will be steeped in the challenges and social charms of MMOs past, but tempered with the best lessons of their contemporary cousins. And, he emphasizes, it won't be for everyone. Scheduled for an official listing on Kickstarter later today [Update: the Kickstarter campaign is now live ], Pantheon grew out of McQuaid's belief that modern MMOs have sagged under the weight of their own massiveness. Effectively, in their drive to please everyone with unwieldy budgets and being "all things to all people," they end up pleasing no one. With Pantheon, McQuaid is taking the opposite approach. "We're identifying a target audience, and we're going to focus on them and make a really great game for them," McQuaid says. "We're not going to concern ourselves with the fact that there may be other MMO fans who may not like our game." Pantheon isn't just a pretty name, nor is its subtitle "Rise of the Fallen," as generic as it initially sounds. McQuaid describes Terminus as a world where fallen dimensional planes rub up against each other like tectonic plates, and jealous God Kings roam the motley environment seeking devotees lest they lose their tenuous divinity to their neighbors. Fallen heroes of the past kept these gods in check in their original settings, and Pantheon follows them as they reassume that role as players in this strange, jigsaw puzzle world. One of the most notable concepts McQuaid mentions is the potential for each of their dimensions to present their own climates and physics. The concept, McQuaid says, is probably best termed "epic planar high fantasy." Stock fantasy races like dwarves, elves, and an assortment of humans will populate the world, and a wider cast (along with player factions and PvP) may also appear if the project meets some of its stretch goals. And it will be hard. McQuaid believes that the successes of brutal games like Dark Souls and Monster Hunter prove that niche games can do well, and he's confident that there's a hefty group of both young and old MMO fans that craves the challenges of the genre's past. "For us, challenging does not mean tedious," McQuaid says. "We're not going to put in repetitive content or grinding just to make the game more 'difficult' or to slow down the gamers." The details of that content system are still in the works, but McQuaid notes that most of it will revolve around a "sweet" class-based combat system incorporating what he believes are the best aspects of modern and older designs. "There's still an auto-attack and you're still selecting abilities and spells, but it's also reactive in that the NPC will have 'tells' that let you know what they're about to do." McQuaid mentions a system of watching for "graphics on the floor" reminiscent of WildStar's telegraphs, as well as the idea that "there may be a target on your friend's chest" indicating that a projectile is about to fire. But it gets better—McQuaid also speaks of using those signals to reflect or even replicate the spells. "We're not just rehashing the past," he said, "Where it makes sense, we're preserving it, but we're also moving forward and innovating as well." McQuaid says players will have to formulate tactics and strategies of their own to succeed, and will have to bring the right equipment, abilities, and items for specific encounters. "You're also not going to have 47 clickies up on the screen," he says. "You've got to think to yourself, 'I've only got 12 slots, I need to decide how many offensive spells I'm going to put in here, how many defensive, and the like.'" But the key emphasis is to nudge players toward helping each other. "Grouping's a big thing," McQuaid says. "I think you get more of a sense of accomplishment out of a shared experience; it's the way we're wired." This grouping content would unfold in both the open world and in instances, and while McQuaid currently believes that most content will take place in the open world, he and the team have yet to formulate an exact ratio. Nonetheless, grouping will be so essential to Pantheon's design that McQuaid sees "less of a difference between grouping and raiding" and players assembling in larger groups earlier than they normally would in competing MMOs. "It's kind of a travesty when players are ripping through these levels and they're not enjoying all the content you've created for you them," McQuaid says, although the exact details of what this content would entail were still being discussed at the time of the interview. In line with that, leveling could end up focusing on more "horizontal" content than "vertical," so (in McQuaid's words) you end up with as much content in 20 levels as you normally would in 50. The drive for communication among adventurers carries over to the economy. "We're probably not going to have a global marketplace," McQuaid says. "Instead, we would like to encourage some form of merchant role with a focus on certain locations and regions." He speaks, for instance, of an ideal situation in which players would farm materials from a dangerous part of the world, bring them back to more civilized zones and make a profit owing to the time and effort involved. McQuaid believes he can pull all this off with the team at Visionary Realms, Inc., which currently consists of no more than 10 industry veterans working out of a garage once or twice a week, with around 10 more awaiting funding before they jump in themselves. Such a close-knit group, he says, mirrors the social experience they want to create with Pantheon. "I think people who enjoyed shared experiences are looking for a game like this, particularly since facing such virtual adversity is a great way to get to know a person," he says. "We want people to have memories of this game, and a lasting memory involves other people."